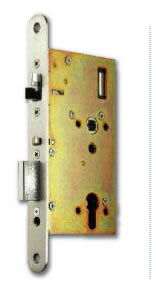 The EL590 is a motorised bolt to be used for wooden or metal doors with a latch bolt. Inside handle operates at all times or can be controlled electrically in two way access controlled doors. Fall locked outside and free egress from inside when handle fitted. The PE 590 has the same features as the EL 590 but meets EN 1125 when used with the PBE-002 panic bar. The EL 590 is a motorised bolt to be used for wooden or metal doors with a latch bolt. Inside handle operates at all times or can be controlled electrically in two way access controlled doors. Fall locked outside and free egress from inside when handle fitted. The PE 590 has the same features as the EL 590 but meets EN 1125 when used with the PBE-002 panic bar. • Bolt position, handle operation and request to exit (RQE). • For cylinder indication additional component required 950885.